So, you all now know that I chose plastic over paper (so to speak) when it came to my Christmas tree this year. I'm hoping that it will last for many, many years to come. I have fond memories, too, of assembling the fake Christmas tree that I grew up with so perhaps my kids will have the same nostalgia. Although I definitely prefer the fresh-cut tree and had dreams of taking the kids out to a tree farm to U-cut a tree, that really isn't realistic right now. And, I must admit, this one is a snap to care for. Plus, since it breaks down, I can manage it myself. Oh yeah, really, my tree isn't flocked pink. What kind of tree (if you celebrate with a tree, that is) do you have this year? Unfortunately, I can only have seven choices in the poll, so if you opted to not have a tree and want that choice counted, add a comment! We have a tree that was given to us about five years ago by my aunt who had used it once. It has served us well, and I foresee it serving us for many more years. FYI, if you have an air compressor in the garage, or a leaf blower, you can use them to "dust off" the tree before storing them for the year. In southern california, there's a program where you buy a living tree that is basically "loaned" to you. After whatever length of time, it is replanted where the wildfires destroyed the forests. I have a bitty foot tall desktop fake tree, but this year I didn't put it out. I rotate my decorations so that they seem new and fresh when I do put them out. Instead, I went to Lowes and bought a fake tree that you are supposed to put outdoors on your porch -- it is in it's own stylishly fashionable urn, it comes in two pieces, you pop them together, stick it in the urn, and plug it in. Voila! The lights are already on it, and it is adorable. Takes about 2 minutes to get out of the box and set up. It's about 4 feet tall, and I put it on the sofa table behind my couch. Gives the illusion of height and everything. Now that I am back in the Christmas spirit I love the cuteness that is my tree! Everybody says sqeeeeee when they see it as it is so cute and I just decorate the heck out of it. I made sure the lights are the kind that if one goes out the whole string doesn't go out. This tree ought to last for years and years and years. And if something happens to it, I am off to get another one just like it. I think it cost about $80. There's my endorsement for the fake Lowes tree. I can only hope it's not coating my lungs with lead as we speak. We have a festive wreath and a few yards of which we decorate with lights and string up along our classically Boston exposed brick wall. It works for us because our postage stamp of an apartment really couldn't handle a tree and there's less waste. I was over at Crunchy's last night and I can say that her tree looks beautiful. I think you made the right decision, opting for the not-real variety. Oh yeah, I have no tree, being that I'm more of a menorah girl. We went out to a tree farm. Organically grown trees? Is there such a thing? I seriously doubt that the guys growing trees under the power lines do anything but trim the trees each year. I'm guessing that ours is "organic", definitely local. Beautiful day yesterday for tree hunting. Now it has a dusting of snow on it, because we didn't put it inside last night. Funny, I just did a blog post on why we do a real tree (we put candles on it). Must be that time of year! My wife and I have gone through the same thing, more or less. We have had live trees and dead trees and no trees. About ten years ago we had a dead tree and my wife's allergies bothered her, so after the season we bought a fake one and have had it ever since. I have read some of the arguments about the choice related to farmed trees and fake trees. We plan to keep our fake one until it shows its age. Hasn't been a problem yet, so it should have a number of years left on it. At that point we will revisit the choice, but with the allergy problem, a fake may be in the works again. A new one every 15 years or so isn't bad. We buy garland made out of the branches trimmed from cut trees. Aside from causing less waste, it hangs up high where it's out of reach of cats and small children, and gives us a place to hang ornaments without discussing the meaning of trees to pagans and lapsed Catholics. Though we have friends whose parents are Christmas tree farmers, so I feel a little guilt at not buying one. Support your local farmers! A few years ago we cut down a small (4 ft) "weed" pine tree in a nature park - the pine trees encroach on the native eucalyptus trees here in Oz. So, while we were killing a tree we figured it's not entirely negative - hopefully a native tree is now growing in its place. Like Rosa, we buy a lower impact garland of local pine. We drape this over the mantle and enliven our home with evergreen scent. I tuck the cards that we receive among the branches. I also display of a few of our favorite ornaments nestled in a pretty bowl or two. The best Christmas tree I ever saw was one we volunteered to deliver a number of years ago. It was a live cut tree that was in the home of a well-to-do family that was going out of town a couple days before Christmas. Since they didn't need the tree anymore, they contacted an area nonprofit to see if anyone else could use it. My wife and I got a call from a friend at the nonprofit to see if we could deliver it to a needy family. We agreed without asking any questions and found ourselves driving to a housing project in the most dangerous part of the city on an icy Christmas eve. The hatchback in our car was open so the tree would fit in, so it was a really cold, uncomfortable trip. We finally arrived at our destination and knocked on the door of the apartment where we were supposed to bring the tree. If I had any doubts about whether this was how I wanted to spend my Christmas eve, they were instantly gone when a single mother and her two young children answered the door. The kids were so thrilled to be getting a Christmas tree. It was the first one they had ever had. They were also in the first real home they had ever had. We walked inside, and were astonished to find NOTHING inside except a few blankets on the floor and a few inexpensive toys. The family had just moved into the space a couple weeks ago from the street. We brought the tree in that, only an hour ago, had been sitting in an upscale home next to a country club. We leaned it up against the corner of the bare walls since there was no tree stand to put it in. The kids were jumping up and down, and the mother kept thanking us over and over. The whole experience really blew us away. My wife cried on the way home. It was so unbelievably moving. We felt so grateful. I think of that family each year when we put up our little artificial tree. No tree at all this year. We're traveling and it just doesn't make sense. Just my trusty Christmas cactus from 200 year old stock. We've gotten really lucky and found that a relatively local state forest lets you cut down Christmas trees for $5, so it's organic, totally natural, and we've made it a tradition and support the "local economy" with a meal at the pizza place. If only we find a local place that would recycle our real tree...we'll have to work on that this year. We have a fake tree that I bought at Target last year - so not green - but, like Crunchy, we plan to use it for many many years. Unfortunately, this was in my-pre-green days and I was not forward thinking enough to get one with LED lights. This means our tree rarely gets lit and, at a minimum, is unplugged when the kiddos go to bed. As a child, I grew up with a green tree because we lived in a wooded area where pine was considered a nuisance tree, compared to all of the lovely hardwoods abounding. 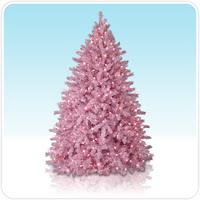 Eventually, my family went with a plastic tree. It's suprisingly beautiful. Looks remarkably like a real Douglas Fir. We've been using it for over 20 years---and it looks like we might get about 20 more for it, back at the family home. It'll set around in the back yard until next fall, then it'll be chopped up and go in the fireplace. Mostly we burn beetle-kill trees. The past two years we've bought rosemary trees about a week before Christmas. They have a wonderful scent that fills the room. After Christmas, we plant the rosemary outside. We actually have numerous trees in our home... kind of a goal. My tradition for about 20 years now is to go to a nearby tree farm to select our tree-- I've been lucky to have lived close to them in both the SF Bay Area and now here in Iowa. I really like supporting the farmers, and giving them a chance to grow something besides feed corn and soybeans. My son also loves running through the farm to find the "perfect" tree, and I've enjoyed observing his height each year as it changes in relation to the trees. Then in January, our town picks up the trees (whether locally and personally cut or imported from out of state) and turns them into mulch for city parks and landscaping projects. This loop has always made a lot of sense to me. BTW, I did a few "cut-it-yourself" trips when I was single too-- the crew at the farm was generally very helpful with the sawing and the loading onto the car-- but I did have roommate & other friend help too! My tree isn't officially organically grown. I was a "plant it and forget it" tree, which are common around here. People plant Christmas trees but get busy doing other things and the trees do OK anyway. I always think the "pruned and painted green" ones look stupid, anyway.